Nanjing Magewell Electronics Co., Ltd. is launching the new Pro Capture DVI 4K, the fifth model in the company's comprehensive line of feature-rich 4K, PCIe video capture cards. The new model joins the Pro Capture HDMI 4K, Pro Capture HDMI 4K Plus, Pro Capture AIO 4K and Pro Capture AIO 4K Plus cards in cost-effectively delivering reliable, high-quality 4K capture for users, systems integrators and OEM partners. 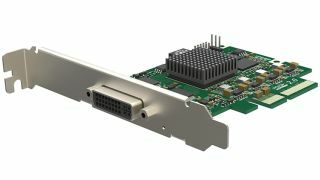 Designed for professional A/V and broadcast applications, the new DVI-input model complements Magewell's previously-announced 4K cards. The Pro Capture AIO 4Kcaptures 4K video at up to 30 frames per second over its HDMI 1.4 and 6Gbps SDI interfaces, while the Pro Capture AIO 4K Plus supports 60fps over HDMI 2.0 and 30fps via SDI. The Pro Capture HDMI 4K and Pro Capture HDMI 4K Plus support 30fps and 60fps 4K video, respectively, for HDMI-only uses. All five cards support resolutions up to the 4096x2160 4K digital cinema and production standard, including 3840x2160 4K Ultra HD. Magewell's universal Pro Capture drivers support Windows, Mac and Linux operating systems, and offer broad compatibility with popular encoding, streaming, live production, collaboration, video conferencing and virtual reality (VR) creation software. For third-party developers, the comprehensive Magewell Pro Capture SDK enables partners to create custom software applications and turnkey solutions leveraging the full feature set and unique capabilities of the Magewell cards.